A summary could be that we had fun but didn’t have time to play much when we had finished talking and created characters and gaming environment but we liked it and will pick it up again to proceed. I give the game four ferrets out of five. 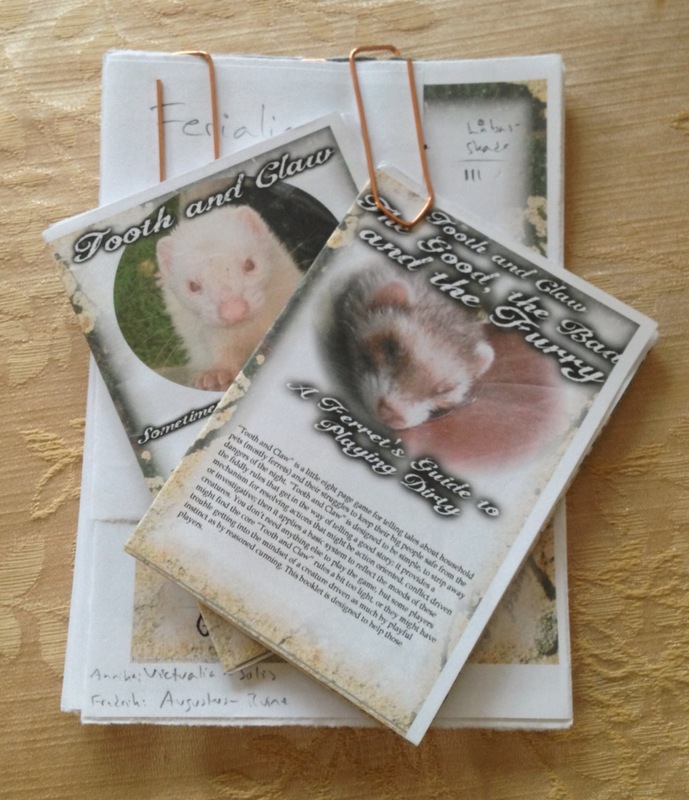 The picture above, by the way, shows the whole rules system, the character sheets, relationships sheets and stash sheets for a business of three ferrets and one ferret next door. It took a little while to create characters, business and gaming environment for the first time but not near as long as for most other games I have played. The second time I think it will be very easy to create the characters. The business relationsships and the gaming environment probably benefit from having some time spent on it. Still it’s totally possible to create characters and play a short story in one evening (for us 4 h minus some chatting and eating, usaually at least 3 h). The Rat Shield, a shield made out of three bottle crown caps. It was used by a rat and taken as a trophy by the ferret business in The Rat War that stood in the large area where the big cellar doorway is. The Deformed Bouncy Ball. It’s very fun to play with since it’s hard to foirsee how it bounces and also a good training. The ferrets always play with it at night to not be in the way of The Big Ones living in the house. One of the keys to the inner doors in the house. The ferets know that these makes it possible to pass the doors when they are closed but has yet to figure out how. A shot glass. They roll funny when laying down. They had two but the other one broke and angered The Big Ones. Also broken glas cuts paws badly. The last thing done before starting the first actual gaming is creating the house where the ferrets live. This is done together and each and everyone can decide thing if no one protests and discuss together is not everyone totally agree or has a suggestion for a change. For our business an old mansion with two floors, a cellar and a side house. In the side house a wild ferret has taken up residence without The Big Ones knowing about it. The wild ferret is the feret next door mentioned in the relationships. The big ones are two grownups, a male and a female, and a small Big One (some years old) that’s very fond of Augustus’s hat, Viktualia’s dress and Ferialia’s socks. In the cellar The Big Ones have built a nice tunnel system to play in. The house is ridden from rats but still contain mice wich isn’t really a problem since they’re good food. The Big ones are nice but sometimes serve boring food. Besides the regular stairs from the cellar and the ground floor and a big cellar doorway to the outside there are two other ways to get from the cellar to somewhere else. One way is behind the boiler that heats the house. There’s an old chimey stack (wich connects the still used tiled stoves)and a newer water pipe. Behind the the chimney stack it’s possible to sneak up to the kitchen but during the cold winter’s of Sweden it gets very hot and it’s tricky to use that way. The other way is with an old dumbwaiter (food elevator) that can be used to get to the ground floor or the top floor. The ferrets can’t operate it themselves though and The Big Ones don’t really like them using it. The old mansion is also equipped with a kennel that is still used by The Big Ones. Three hunting dogs, beagles, live there. Close to the houses are also a park/small forest. The forest is kept at bay by Big Ones and the trees were chosen by Big Ones to be nice to walk among so it’s mainly trees without lower branches (birches rather than pines for example) and bushes. The scenario started in the early evening when the ferrets woke up. They had gotten their food but wasn’t really hungry yet and The Big Ones were sitting half-sleeping in the sofa while the small Big One were playing at the upper floor. The ferrets found some icky goo on the kitchen floor, tracked it to the big machinery that kept The big Ones' food cold and with a lot of fiddling (removing a panle) and with the help of a piece of a candle from Augustus stash fixed the hole where it was leaking. In the process The big Ones were disturbed by Viktualia who were put in the cellar with the door almost closed behind her. Viktualia and Ferialia manged to, but barely, open it again and Viktualia could join the problem solving. When Augustus ran away to fetch the thing-that-could-solve-the-problem from his stash Ferialia tracked him but was lured into a trap by Augustus and instead of finding Augustus’s stash Ferialia found herslef in the claws of the small Big One who put on here two of here socks wich didn’t make anything easier. On top of that the door to the room got closed as a result of fallout and Ferialia had big problems getting rid of the socks and getting out to the stairs and down to the others. In the meantime Augustus had fetched the candle piece and clawed and gnawed it into a fitting piece for the leaking hole. During that time The Big Ones' eyes also had caught a glimpse of the puddle in the kitchen and deducted that the ferrets had toppled something again. Especially since Ferialia had jumped/climbed up on the kithcen bench but instead of finding some tool fallen into the sink, yelp, bounced and and jumped/fallen back to the floor and made a lot of noise in the process. Here we stopped because it was getting late and we all had work to attend the next day. As mentioned we will continue play later on if there’s no regular gaming meeting at the regular gaming day or if we shoudl find a day where we don’t really know what to do and feel for some role-playing. Oh, I forgot about the chocolate. The first idea to stop the leaking was to use the wrapper paper of The Big Ones' chocolate that was left one table. Viktualia fetched it easy but then another problem showed up. Not eating the nice choclate, the wonderful chocolate that makes you, a ferret, so sick. They all managed to just lick it a little or lick it much but not eating.